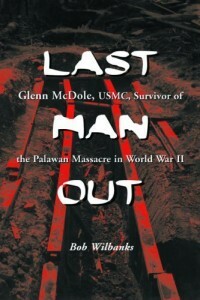 This is a review of the Kindle version of Last Man Out: Glenn McDole, USMC, Survivor of the Palawan Massacre in World War II. By Bob Wilbanks. Disclaimer: I have a personal connection to the main characters of this book so I might be biased in my review. That said though, this is a great read. I found it very hard to put down while I was reading it. I give it 5 stars! The defense of the Philippines by the U.S. and Filipino military at the start of WWII is fading from memory and it never should. With no supplies and no hope of evacuation or reinforcement, the men and few women there went through more suffering than anyone should be expected to. On 14 December 1944 150 prisoners of war housed on the island of Palawan in the Philippians were sent into their air raid shelters by a fake alarm. Once in the shelters, the Japanese guards threw in barrels of gasoline and flaming torches. The men who did not die in the flames were killed by machine gun and rifle fire. 139 men died in the massacre. Only 11 escaped. Last Man Out is the story of what the U.S. forces in the Philippines had to endure before, during and after the events of 14 December. While the suffering they went through was truly horrible and the book makes clear just how cruel humans can be to each other, that is not the lesson to be learned from this compelling tale. Don’t dismiss this as just another war story. Last Man Out is really about how the men in the prison camps were able to support each other to survive. It is an inspiring story of loyalty and perseverance in the face of incredible adversity. As terrible as the events recorded were, the personal stories of the POWs is an uplifting lesson in the power of the human spirit.